Need more information about booking Home 213491 ? Set within a relaxed rural environment yet only 3-4 minutes drive ,or a pleasant 20 minute walk, to the nearest town which has 2 bars one with a lunch time restaurant. There are a variety of shops and businesses in the village including, a boulangerie, hairdressers, Artisan Chocolatier, pharmacy and a GP surgery. There is a bar restaurant in Parcay which is about 5 minutes drive away that opens daily. On Monday and Wednesday evenings products can be bought direct from the local organic farm shop. Recently refurbished to a high standard this self-contained dwelling adjoins the owners own farm house and can comfortably sleep 4-5 people. La Cour de Pierres is laid out over 2 floors of a tower which gives a dual aspect over the courtyard on one side and rolling fields and woodland on the other. On the ground floor there is an open plan kitchen and lounge diner. The shower room is also on the ground floor. The lounge has English satellite TV, DVD and access to wireless internet.The kitchen has a range of units and ample work-surfaces with fridge with freezer compartment, gas cooker and microwave. A washing machine is available for the use of guests and there is a clothes line in the garden. La Cour de Pierres has a pleasant private garden area with garden furniture, and a barbecue for our guests. The farmhouse is set in 1.8 hectares of farmland adjacent farmland and is ideal for those who enjoy walking and cycling with forests and open countryside close by. 4 cycles are available for the use of guests free of charge and at own risk . Chickens provide fresh eggs for purchase if visitors wish. The dogs provide a friendly welcome and the horses add to the view. Throughout spring and summer many birds can be located in and around the property and during the night the resident owl adds its voice to the gentle nocturnal sounds of the countryside. There is open air swimming, 10 minutes by car in Noyant and further afield in Le Lude which are available throughout July and August. Indoor pools are available during the rest of the season. There is a mini beach and indoor pools in Saumur. The property is ideally situated for those wishing to enjoy the 'degustation de vin', sample the local wines from the nearby vineyards of Bourgueil and Saumur along the wine trail or visit the chateaux of Saumur, Amboise, Villandry and many more. For those wanting a little more action there are many organised attractions nearby including canoeing down the Loire, horse riding, Terra Botanica, Zoos and the Troglodyte caves. La Cour de Pierres offers the warm, friendly atmosphere of informal farmhouse living where proprietors, Tony and Gillian Stone are available to give helpful advice on local amenities and attractions. Well behaved pets are welcome with prior agreement of the owners. A car is essential to stay at the property but once you have arrived bicycles are available for the use of guests. There are 4 on hand at all times but it may be possible to provide an 5th on request. Please note that all cycles are for adults. Gill and Tony are on hand during your stay and can help with any problems, advise on places of interest to visit and which is market day in the local town. The amount of interaction is determined by the guest and their requirements. If advice or information and help with anything is required then we are more than happy to provide it, if you wish to be self sufficient then this is also good. We spent a wonderful ten days here recently. Gill and Tony, the owners (who live next door) strike exactly the right balance - welcoming, friendly, relaxed and helpful, without ever being in any way intrusive, The cottage itself was the perfect size for our family of five (six if you include the dog! ), and had everything we needed as a family: (two bathrooms, cooker, TV, microwave, wi-fi - there is a washing machine in an outbuilding too) The garden is a good size for the kids to play in, but lovely and quiet in the evenings at barbecue time! it's in a tranquil location, right next to a forest, with many walks to explore, yet only a short five minute drive from the nearest village and supermarket. Saumur, the nearest big town (around 11 miles away), is lovely, and it wasn't that much of a stretch to head out on day trips to the further chateaux of Villandry and Chenonceaux (both highly recommended). We loved staying here - we hope we will again! We couldn't have picked better! This was our little bit of heaven for our two weeks stay. The gite is very well equipped & immaculately clean, a lot of thought has gone into providing everything you could possibly need and nothing has been left out. The location is perfect for exploring the many delights of the Loire or for just enjoying leisurely walks around the beautiful surrounding countryside. Through the day the gite offers a fantastic private garden space to enjoy the sunshine and in the evening, a relaxed terrace in the courtyard where the local wine can be sampled & enjoyed. Gillian and Tony were fantastic hosts, especially including our two young girls in dog walking, duck feeding and horse grooming, they absolutely loved it. Huge thanks to Gill and Tony for making our stay so pleasurable. We would thoroughly recommend this gite to families, couples, & those with pets and hope to return ourselves very soon. Booked this last minute & so glad we did. We travelled with our two dogs & the property was ideal, with its huge private garden & numerous circular walks to be enjoyed without getting into our car. The property itself was light & airy, with lovely rural views. The gite is well equipped & maintained to a high standard. The owners Gill & Tony life in the adjoining farmhouse & although on hand for advice if needed, were unobtrusive. Close by is a village with bars & restaurant & a good supermarket with petrol station. We moved on after a week having booked a gite in the Charente but would have happily stayed here for the two weeks. Ideal holiday destination if you are travelling with pets or children due to the large garden & relaxed hosts. Le Gîte, situé dans la campagne de Saumur, est très agréable, calme, propre, et doté de deux grandes chambres et d'un salon convivial. Idéal pour nous qui étions deux couples avec de jeunes enfants (nous avons pu mettre les lits parapluie dans les chambres). Il y a un grand jardin, les enfants peuvent courir et profiter des animaux. A notre arrivée, Gillian nous a accueilli avec un panier de bienvenue contenant une bouteille de vin de la région, des fruits de saison, du jus d'orange et du pain. Il y a également tout le nécessaire pour cuisiner, les serviettes de toilette ainsi que les draps... très pratique, surtout lorsque l'on part seulement pour 3 jours. Les environs sont propices à de belles balades parmi les champs et Saumur n'est qu'à 20 minutes en voiture. Il y a également plusieurs châteaux à visiter (nous avons été à celui de Brézé) et des caves à vin pour de bonnes dégustations! Nous y reviendrons avec plaisir, c'est un très bon rapport qualité prix. This gite is immaculate and very comfortable. It is well equipped and a great place to relax after days out. The owners, Gill and Tony are friendly and informative with suggestions of places to visits such as the local markets. The location near the village of Vernoil le Fourrier is perfect for those wishing to explore the area by car, without diving large distances and a walk through the surrounding woods and apple orchards is a pleasure. Gill and Tony were kind and welcoming and on hand to assist with any matter. The welcoming pack is substantial and will keep you going. We have no hesitation in recommending this gite to anyone - couples, families etc. Many thanks Gill and Tony for making our stay so pleasurable. We thoroughly enjoyed our stay. Gillian and Tony were very welcoming and helpful and the gite was well equipped both inside and out. The 'welcome package' was really thoughtful and much appreciated. The weather was wonderful, perfect for lazing aroung in the garden. We enjoyed walks in the area and and the birds and moths [2 of our main hobbies] were great. The town of Saumur, a short drive away, is very attractive amd well worth visiting, especially on market day! We also enjoyed a wine tasting in St Nicholas de Bourgueil. All in all a relaxing break, we were really sorry to leave. We were lucky enough to find this lovely gitte to settle during our stay in the Loire. Gillian & Tony were so hospitable, we felt at home immediately. The gitte is clean and the bedrooms are a good size. Nothing was too much trouble for the owners who were on hand but never overbearing. Well placed for wine tasting within a few miles, Futurescope for the kids (an hour an a half away) and lovely walks nearby. The grown ups in our group are not dog lovers but how could we not not love Rolly & Boots? We slept like never before & returned fully re-charged. An excellent place to stay. The kids who often get homesick, didn't want to leave and that's a first. Don't construct your idea of the perfect stay, just visit Gill & Tony and enjoy all the Loire has to offer. This lovely little two bedroom gite is set on a gorgeous farm nestled between the villages of Vernoil-le-Fourrier and Vernantes. It is only a twenty minute drive to the bustling town of Saumur, and within a 30-60 minute drive to many of the chateaus of the Loire region, canoeing/kayaking, wine caves and local wineries, and other activities. 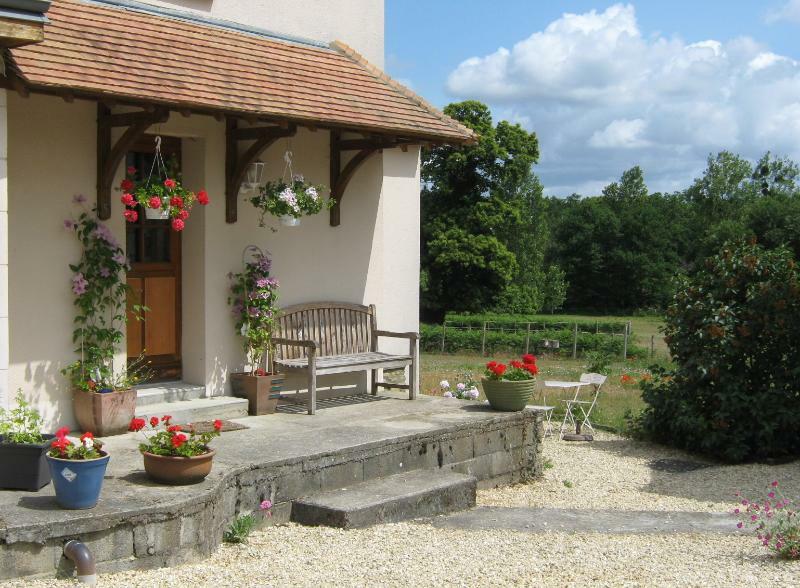 If you want to be centrally located in the Loire region and have a lovely, peaceful place to come home to, this is it. The owners are gracious, friendly and warm - they are kid-friendly, inviting our 10-year old daughter to feed the horses and collect the chicken eggs. The gite also has a fully equipped kitchen where we cooked our breakfast and most of our dinners, foregoing the cost of eating out 3 meals a day. The beds were extremely comfortable and easy on our bad backs, and the peace and quiet of the gite and the beauty of the surrounding area was incomparable. This was the perfect oasis to return to after our hustle-bustle days of sightseeing. We would come back again - no question!